After a couple of years of meeting in a local Denny's Restaurant the Las Vegas Radio Amateur Club is moving to a new meeting spot. Thru the generosity of the Red Rock Search and Rescue group, LVRAC will now be able to have their monthly gatherings in an actual meeting room. LVRAC President Jerry Sobel KØMBB announced the change of venue and meeting dates. The new location at 340 Villa Monterey Dr. Las Vegas, provides adequate space to conduct meetings and programs. Their meeting nights will also change, from the third Thursday to the THIRD WEDNESDAY of the month with their next two meetings being Nov 19, 2014 and Dec. 17, 2014 beginning at 7:00 P.M.
Red Rock Search and Rescue is an all-volunteer, NASAR fully certified, Search and Rescue Team which began two years ago as a grass roots effort to find missing hiker Ron Kirk. Their motto "We Don't Quit" is also their commitment. 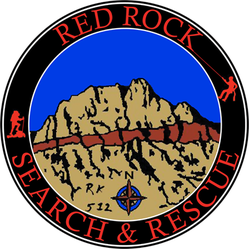 Red Rock never calls off a search until the victim is found, often after all other agencies have given up. Members of the group are required to become licensed hams. The group provide in house license training to it's members and also provides their facility for amateur radio license examinations for the Las Vegas community.